On July 28, 2011 the Cardinals acquired Kolb from the Philadelphia Eagles for CB Dominique Rodgers-Cromartie and a 2012 2nd-round pick. The next day they signed former Carolina Panthers starting CB Richard Marshall. 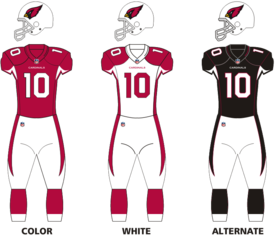 The Cardinals' preseason schedule was announced on April 12, 2011. Coming off their bye week, the Cardinals went home for a Week 7 interconference duel with the Pittsburgh Steelers, in a rematch of Super Bowl XLIII. Arizona trailed early in the first quarter as Steelers quarterback Ben Roethlisberger completed a 12-yard touchdown pass to tight end Heath Miller. Pittsburgh would add onto their lead in the second quarter as Roethlisberger completed a 95-yard touchdown pass to wide receiver Mike Wallace. The Cardinals would answer with a 1-yard touchdown run from running back Alfonso Smith. The Steelers would close out the half with kicker Shaun Suisham getting a 41-yard field goal. Arizona opened the third quarter with quarterback Kevin Kolb finding running back LaRod Stephens-Howling on a 73-yard touchdown pass, but Pittsburgh struck back with Roethlisberger completing a 4-yard touchdown pass to wide receiver Emmanuel Sanders, along with Kolb's intentional grounding penalty in the endzone resulting in a safety. In the fourth quarter, the Steelers continued to pull away with Suisham making a 42-yard and a 39-yard field goal. The Cardinals tried to rally as Kolb found wide receiver Early Doucet on a 2-yard touchdown pass (with a failed two-point conversion), but Pittsburgh held on to preserve the victory. With the loss, Arizona fell to 1–5. ^ The Cardinals acquired this sixth-round selection (No. 184 overall) in a trade that sent guard Reggie Wells to the Philadelphia Eagles. ^ The Cardinals traded their original seventh-round selection (No. 208 overall) and a 2010 fourth-round selection to the New York Jets in exchange for safety Kerry Rhodes. ^ a b c d e f g h i The state of Arizona lies entirely within the Mountain Time Zone, but does not observe Daylight saving time (excluding the Navajo Nation), so it is effectively the same as Pacific Daylight Time from mid-March until the first Sunday of November. Therefore, all kickoffs during the preseason and from Weeks 1–8 during the regular season are listed as Pacific time, while kickoffs from Weeks 9–17 are listed as Mountain time. ^ Pro-Football-Reference.com: In a single season, from 1940 to 2011, in the regular season, team won game, Game went to overtime, sorted by descending Date. This page was last edited on 15 March 2019, at 10:32 (UTC).